A swirly ribbon of rich cheesecake batter runs through the center of this banana quick bread. Made with a bread mix, it's ready to bake in minutes. Beat cream cheese, sugar and egg with mixer until well blended. Prepare bread batter as directed on package; pour half into 9x5-inch loaf pan sprayed with cooking spray; cover with cream cheese mixture. Top with remaining batter; swirl gently with knife. Bake 55 min. to 1 hour or until toothpick inserted in center comes out clean. Cool 10 min. Remove from pan to wire rack; cool completely. Store, tightly wrapped, in refrigerator. 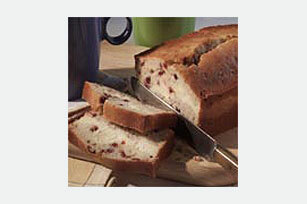 Prepare as directed, using cranberry quick bread mix. Desserts containing cream cheese, whether baked or unbaked, should be covered and stored in the refrigerator. Use within 5 days.